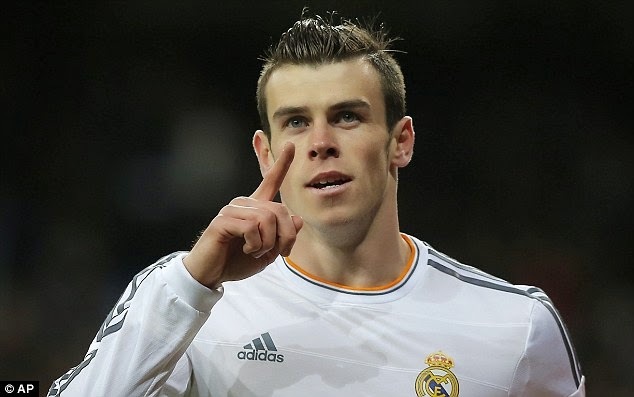 Real Madrid star Gareth Bale has been named the fastest player in the world, according to a recent study conducted‎ by Mexican club Pachuca. The Welsh’s top speed was put at 36.9km/h. (2) Jürgen Damm (Pachuca) 35.23 Km / h.
(3) Antonio Valencia (Manchester United) 35.1 km / h.
(4) Aaron Lennon (Tottenham Hotspur) 33.8 km / h.
(5) Cristiano Ronaldo (Real Madrid) 33.6 km / h.
(6) Theo Walcott (Arsenal) 32.7 km / h.
(7) Lionel Messi (Barcelona) 32.5 km / h.
(8) Wayne Rooney (Manchester United) 31.2 km / h.
(10) Sergio Ramos (Real Madrid) 30.6 km / h.
Previous#NigeriaDecides: General Buhari still in lead. NextAyo Fayose reacts to Buhari’s impending victory.